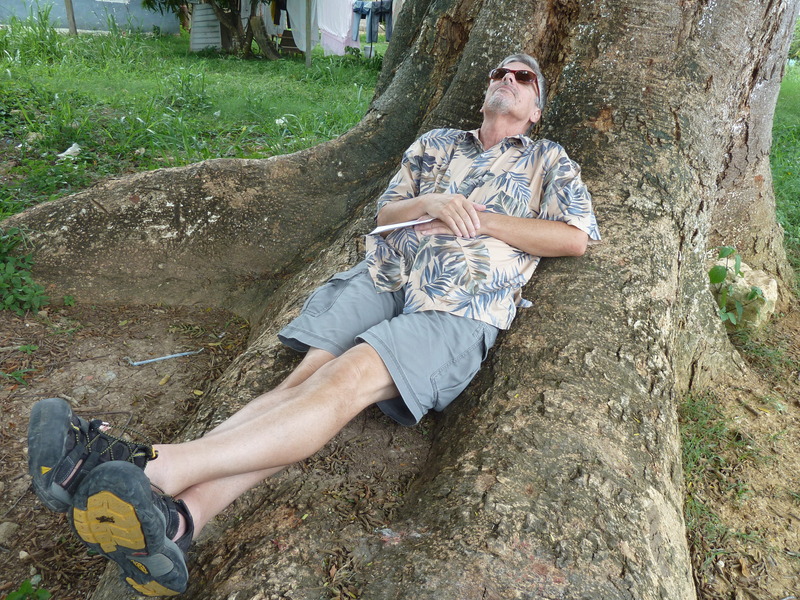 If you start feeling stressed in Belize, just find a nice sized tree to lie down in for a while till the tension passes and maybe say a word of thanks to God for all the many blessings He/She has given you this day and every day of your life. Of course, you don’t have to find a big tree to calm down in to thank God for all the many blessings He/She has given you this day and every day of your life. Just stop where you are, do some mindful breathing, conscious of breathing in and conscious of breathing out, and thank God for that breath of life you have today. 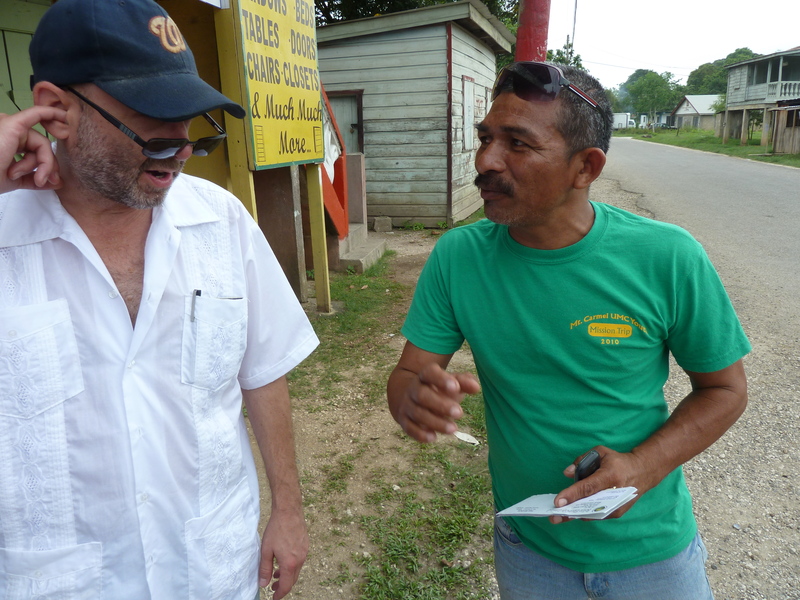 SO MY LANDLORD HAS BEEN HERE FROM HIS HOME IN WASHINGTON D.C. FOR A FEW DAYS AND GRACIOUSLY TOOK ME AROUND SOME YESTERDAY TO GET A GREATER SENSE OF THE LAY OF THE LAND HERE IN FAR WESTERN BELIZE. THIS IS A PICTURE I TOOK STANDING IN FRONT OF THE LIBRARY IN THE BEAUTIFUL VILLAGE OF BENQUE, WHICH BORDERS GUATEMALA AND IS A 30-MINUTE WALK FROM MY HOUSE IN NEIGHBORING SUCCOTZ VILLAGE. 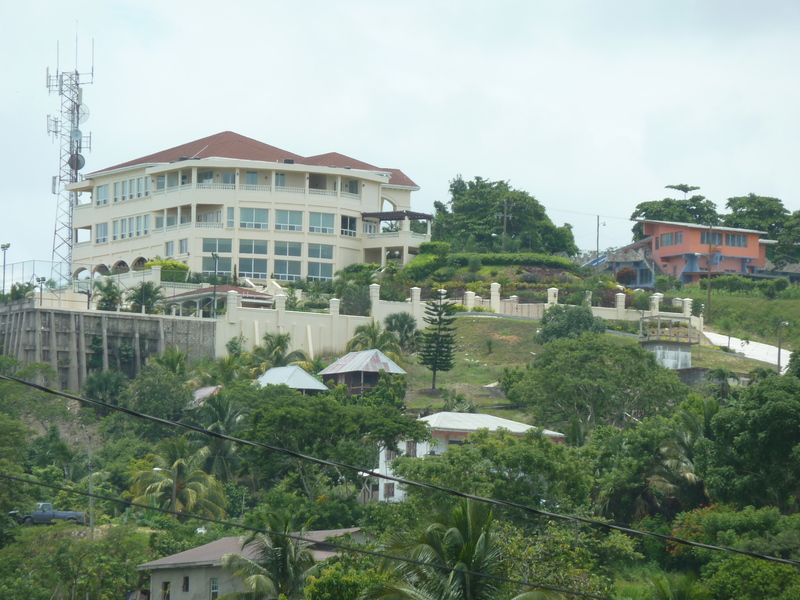 THE DEPUTY PRIME MINISTER OF BELIZE LIVES IN THIS HOUSE ON ONE OF THE MANY HILLS OVERLOOKING BENQUE. THOSE WHO HAVE BEEN IN IT SAY THE DRIVEWAY IS DESIGNED IN SUCH A WAY THAT YOU FEEL LIKE YOU ARE DRIVING UP TO THE WHITE HOUSE. I DO PLAN TO WALK UP AND TAKE A LOOK AROUND UP THERE SOME DAY. 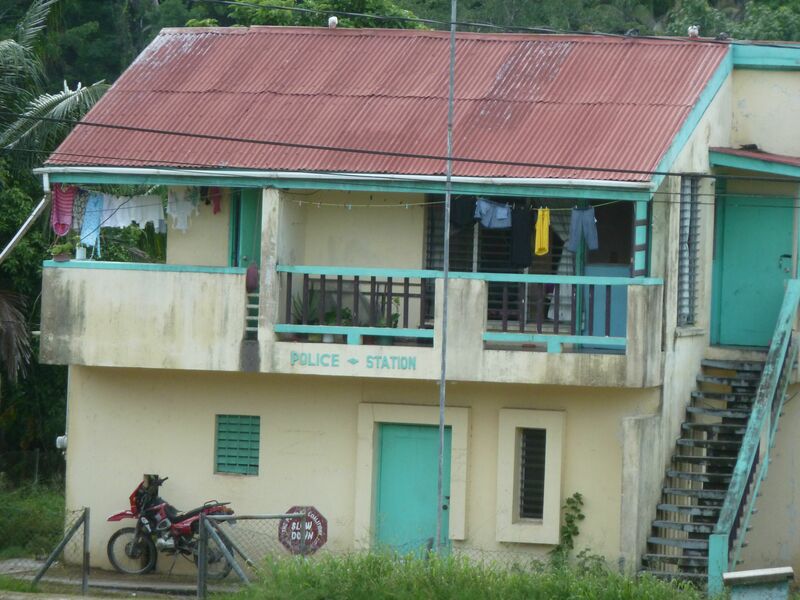 EVERY GOOD COMMUNITY HAS A GOOD LIBRARY AND BENQUE VILLAGE HAS A FINE AND MIGHTY FINE NEW ONE. TAKE A LOOK INSIDE. 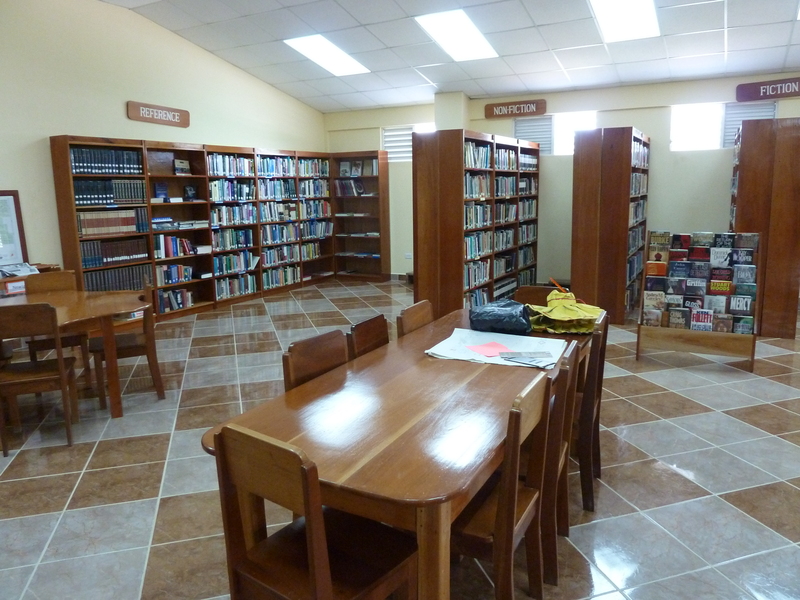 THE BENQUE LIBRARY IS A BEAUTY WITH ITS SHINY WOODEN FURNITURE AND TILE FLOORS. BEAUTIFUL TILE ABOUNDS IN THIS PART OF THE WORLD, AS DOES BEAUTIFUL, HAND-MADE WOODEN FURNITURE. BUT THIS LIBRARY ALSO IS QUITE WELL STOCKED WITH THE SORT OF BOOKS YOU’LL FIND IN ANY GOOD AMERICAN COUNTERPART, PLUS RESOURCES ON ALL THAT LOCAL MAYAN HISTORY AND CULTURE, AND A VERY SPACIOUS AND NICE COMPUTER ROOM AND INTERNET ACCESS MAINLY FOR THE LOCAL STUDENTS. MY LANDLORD HELPS OUT THE LIBRARIES AND SCHOOLS WITH DONATIONS WHEN HE COMES DOWN TO BELIZE EVERY FEW MONTHS FROM D.C. 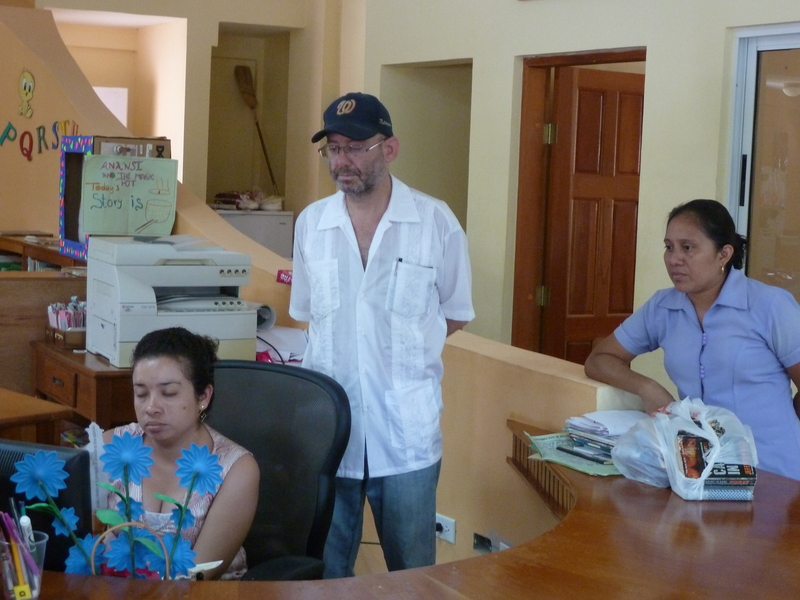 THE WOMAN TO THE RIGHT IS MIRIAM, THE LIBRARIAN AT THE BENQUE LIBRARY. 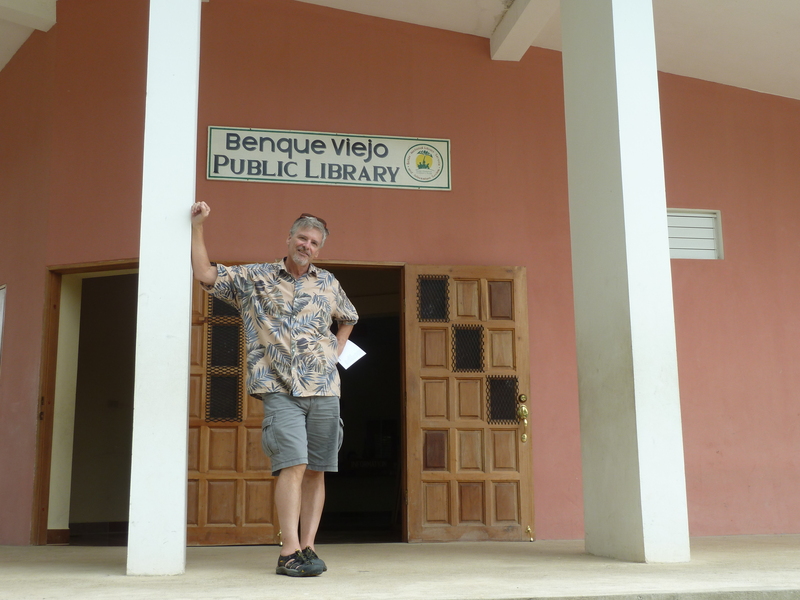 I’M GETTING A LIBRARY CARD AT THE LIBRARIES IN BENQUE, MY HOME VILLAGE OF SUCCOTZ AND IN SAN IGNACIO’S NICE NEW LIBRARY. FIRST, THOUGH, I WILL HAVE TO PROVE I’M LIVING HERE TO A JUSTICE OF THE PEACE FOR HIM TO SIGN OFF ON IT. DID I TAKE A WRONG TURN OR WHAT? 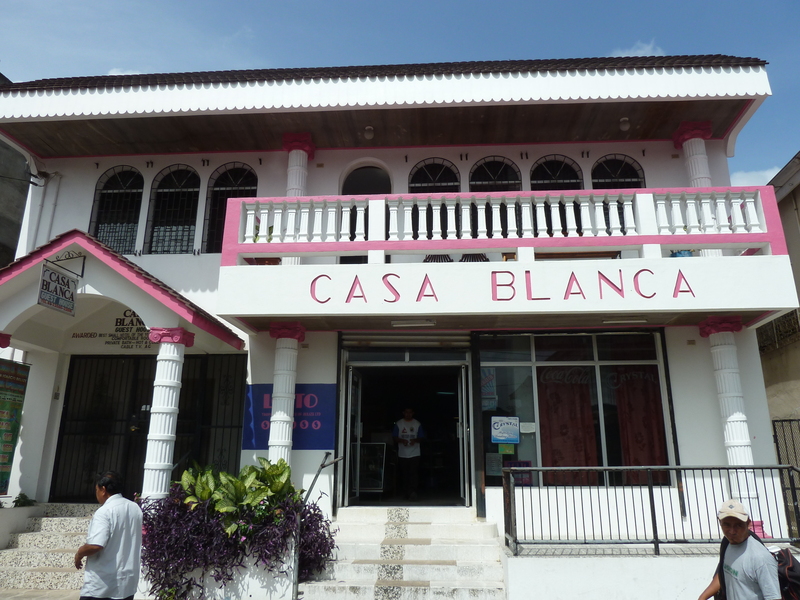 CASA BLANCA ON THE BUSTLING MAIN STREET IN SAN IGNACIO WAS NAMED BEST SMALL HOTEL IN BELIZE A COUPLE YEARS AGO FOR GOOD REASON–IT’S A REAL CHARMER OF AN INN. 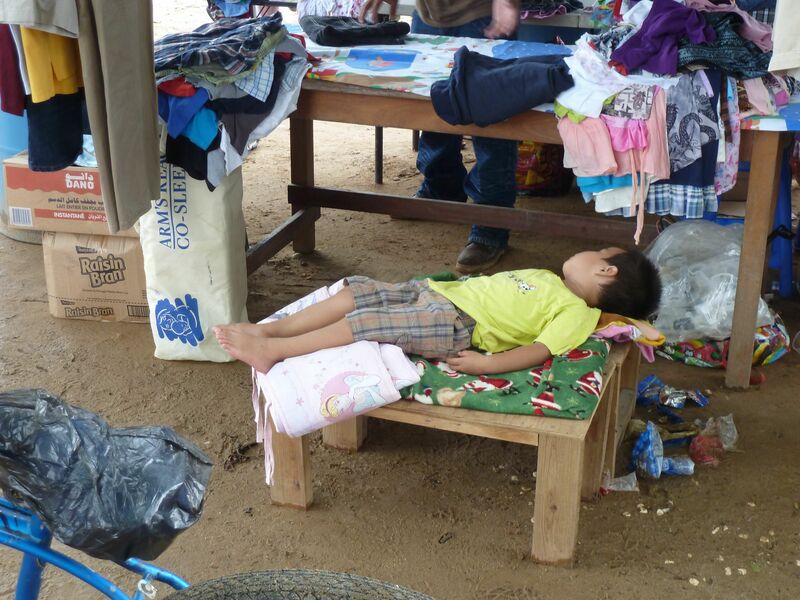 SO OF COURSE I WAS BACK AT THE MARKET IN SAN IGNACIO THIS PAST SATURDAY–(NOTE TO SELF–GO TO SATURDAY MARKET AFTER NOON, LIKE YOU DID THE FIRST TIME, NOT BEFORE NOON, WHEN THE CROWDS CAN BE, WELL, CROWDING). THE PEOPLE WATCHING AT SATURDAY MARKET HAS TO BE THE BEST IN BELIZE AND I’M COLLECTING QUITE A PICTURE COLLECTION OF ALL THE COLOR AND THE CHARACTERS. PICTURED ON THE RIGHT IS MY BUDDY JUNIOR. HE AND HIS FAMILY LIVE ACROSS THE STREET FROM ME IN SUCCOTZ VILLAGE AND JUNIOR IS THE HANDYMAN I CAN CALL ON FOR ANY NEED OR ANY QUESTIONS ABOUT HOW TO GET AROUND. HE’S 100 PERCENT MAYAN, WITH BLOODLINE THAT GOES WAYYYYY BACK TO THE DAYS WHEN LITERALLY MILLIONS OF MAYANS DOMINATED BELIZE AND GUATEMALA. BELOW MY FEET EVERY DAY I WALK OVER LORD ONLY KNOWS HOW MANY MAYAN TOMBS, BODIES, RUINS AND ARTIFACTS. 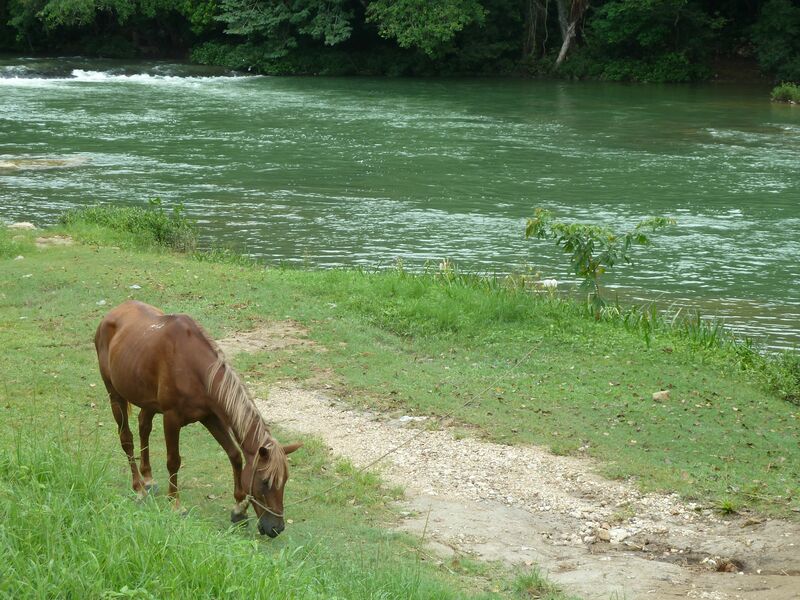 THE MENNONITE FARMERS PARK THEIR HORSES AND BUGGIES DOWN BY THE RIVER WHEN IN SAN IGNACIO. 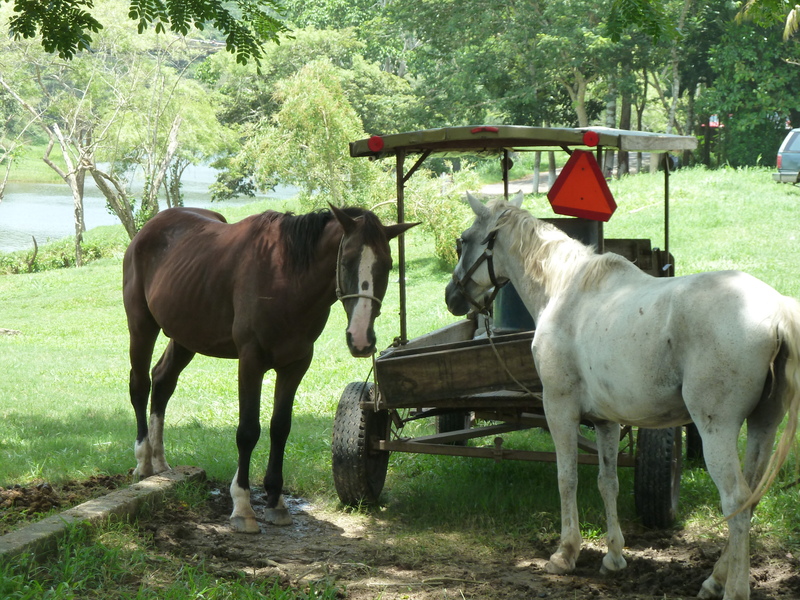 THE MANY DUTCH AND GERMAN OLD-TIME MENNONITE AGRARIANS HAVE CONTRIBUTED A LOT TO ADVANCEMENTS IN AGRICULTURE AND EVEN SOME ENGINEERING IN BELIZE. I’LL BE DOING AN ARTICLE ON THAT INTERESTING STORY SOME DAY. MEANWHILE, BACK IN THE HOME VILLAGE. . . . BUS DRIVER WASHES DOWN THE WINDOWS OF THE TOUR BUS WHILE THE TOURISTS ARE OFF SEEING THE MAYAN SITE HERE IN VILLAGE. CHINESE-BELIZEAN BOY ATTACKS OLD-FASHIONED AMERICAN-STYLE CORNY DAWG!!! 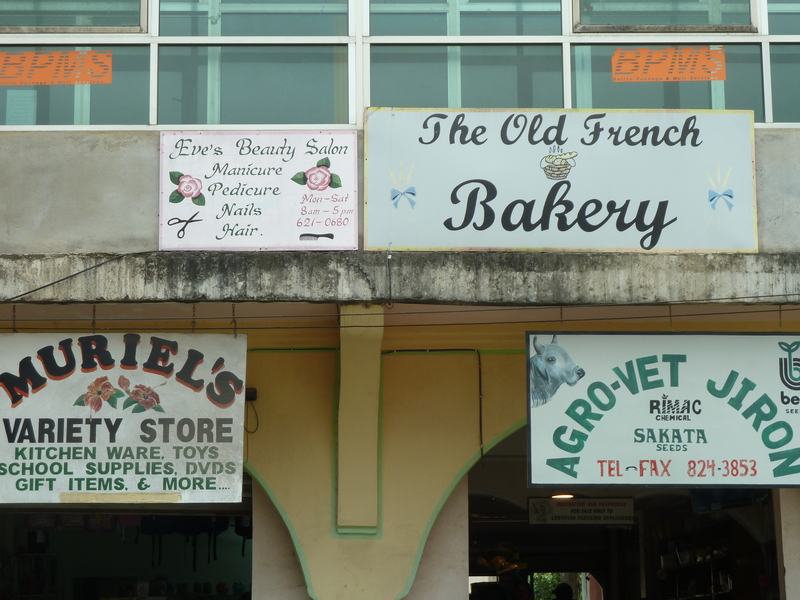 BELIZE HAS TENS OF THOUSANDS OF CHINESE, BUT THEN, BELIZE IS INCREDIBLY DIVERSE. 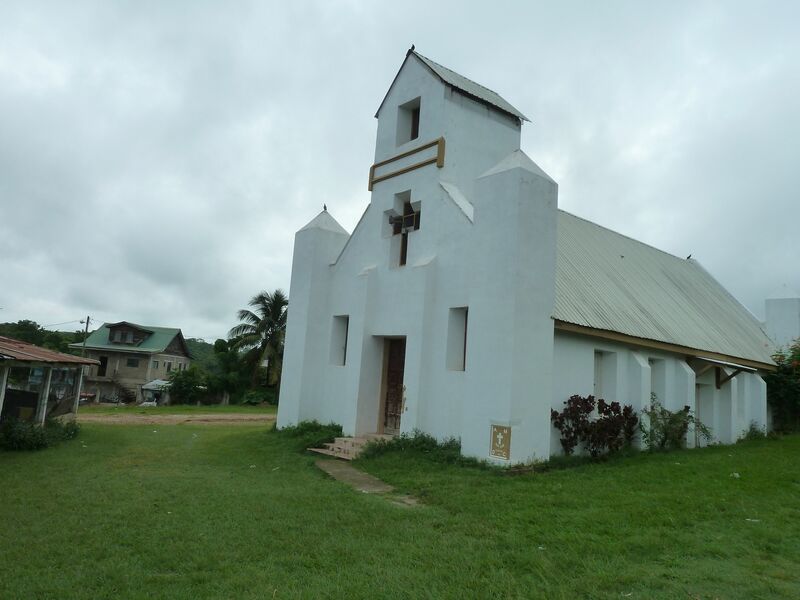 4 percent of population in Belize is–no kidding–Mennonites. I’ve already had an invitation to one of the smaller Mennonite communities, one with 40 families where these two young men live, and look forward to visiting someday soon. So I made it over to the big weekly market in San Ignacio Saturday, where one finds row after row of very affordable and healthy beans, veggies and fruits at stalls and under massive canopies. Was a little surprised at all the other vendors, hawking everything from bicycles and couches and stick-free skillets (bought one) to dazzling, hand-carved crafts. 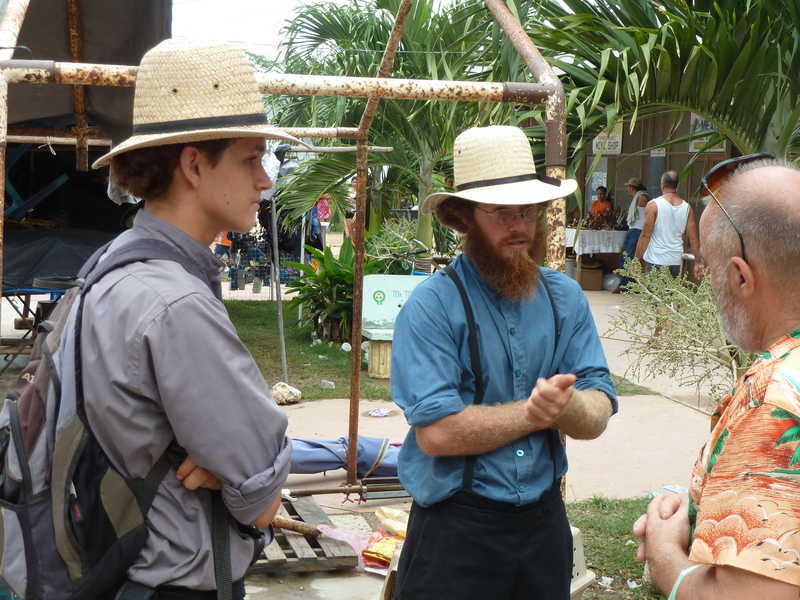 In the photo above: I was surprised in my pre-move research on Belize to learn there is such a large population of traditional Mennonites in western Belize. Mennonites are of the same spiritual lineage as the Amish (Anabaptist) and are committed to pacifism and simple living whereby they plow with mules and get around (most of them) in buggies, although they aren’t above catching the cheap cabs and even cheaper public buses that I use my own self. 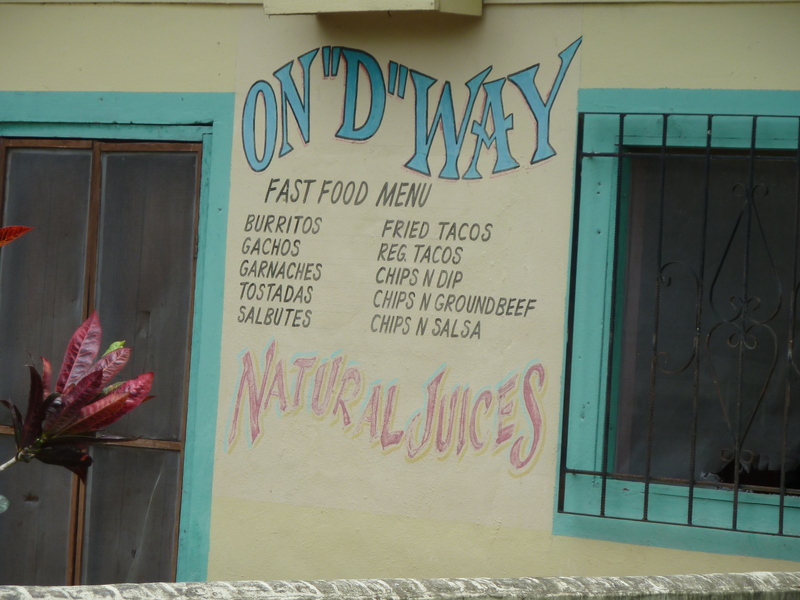 It takes 75 cents by bus for me to get to the bustling twin towns of San Ignacio/Santa Elena, which fits my budget fine and besides–some of the bus drivers play American rock classics at about 95 decibels for those sitting up front. Heading back home to Succotz Village the other night, the driver had “Hotel California” blaring from the boom box he has mounted at the front and he and I and the porter started singing along to Don Henley’s haunting classic song, the one where you can check out any time you like (but you can never leave). I asked the driver if he had any Texas music and at the next stop he pulled out a Freddy Fender CD and played us some “Wasted Days and Wasted Nights” and some Texas Tornadoes, “Hey Baby, Que Paso?”–another great singalong for a bus ride. 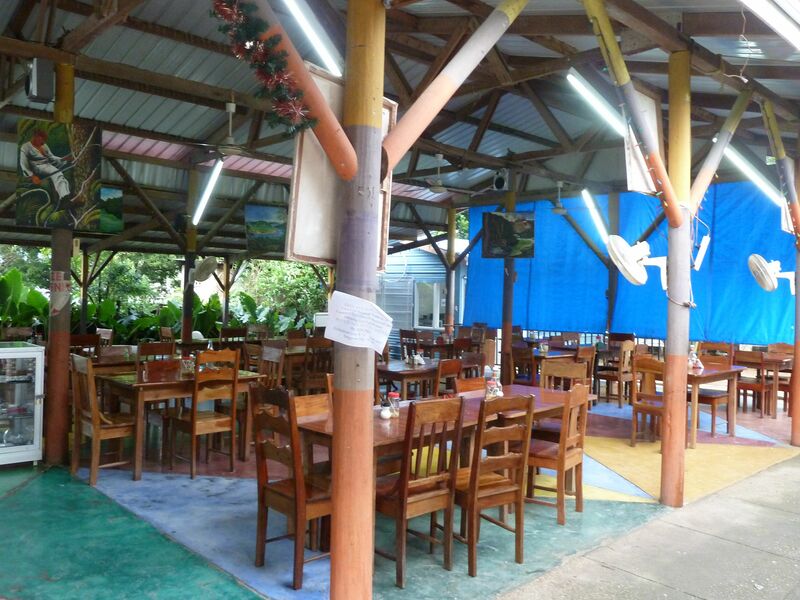 Belize also has a huge number of Chinese who have been here for a long time and own most of the grocery stores and a number of other shops and businesses. I’ve been in some quite diverse countries but Belize truly has to have the most amazing mix of bloodlines I’ve ever seen. Latin, Caribbean, Creole, Mayan, European Mennonites, African and mixes of interesting varieties–they all are here. The small population of over 300,000 includes 4,000 American expats who have permanent residency status, which is easy to attain if you live here 12 months with no more than 14 days travel outside the country in that year, and 4,000 Canadian snowbirds who came to escape the winters. 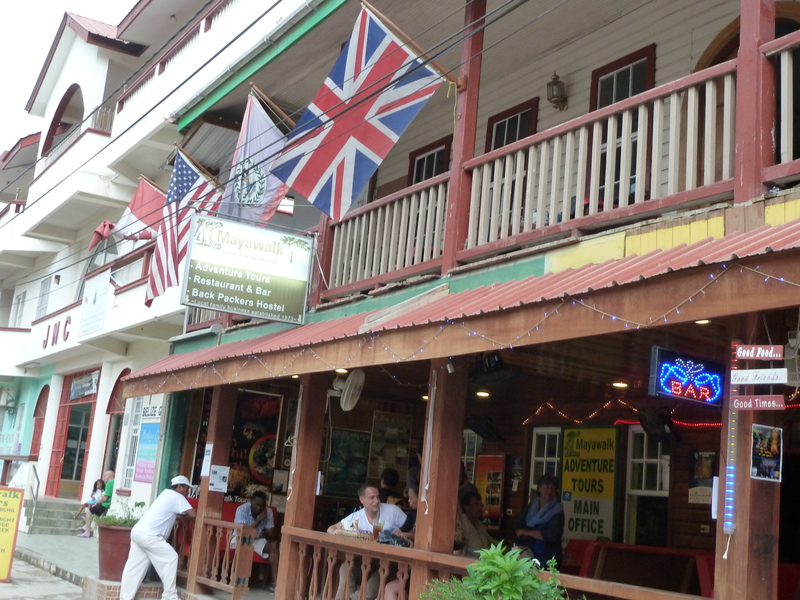 Plus a lot of Brits since Belize was British Honduras until it voted for independence in the eighties. Members of the Royal Family are in some part or other of Belize once in a while–Prince Charles visited here in western Belize earlier this year, in fact, for a commemoration at one of the Mayan sites. 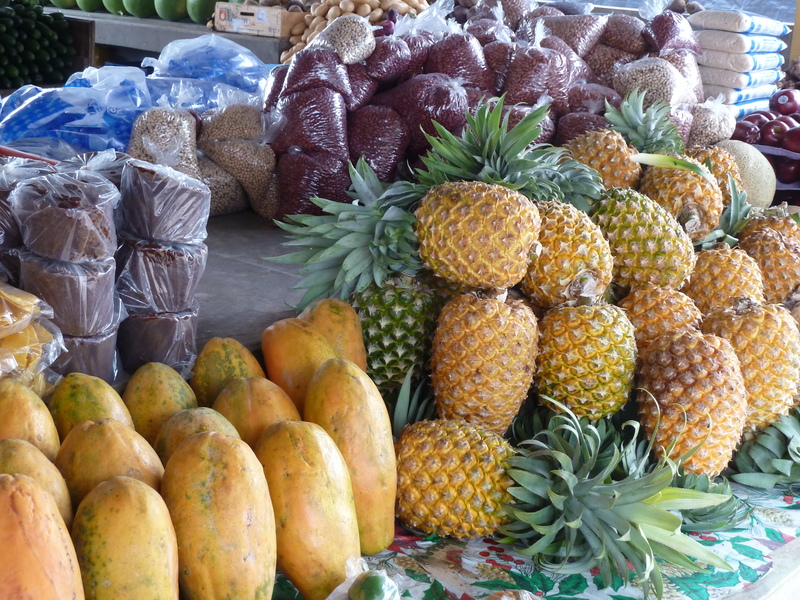 More pix for you . . . .
SATURDAY MARKET IN SAN IGNACIO, WHERE THE GROWERS BRING IN TONS OF TROPICAL FRUIT, LARGE ORGANIC VEGGIES AND BAGS OF RED BEANS, BLACK BEANS, BLUE BEANS, AND IF YOU LIKE BEANS YOU WOULD LOVE WESTERN BELIZE. GOOD STUFF, AND CHEAP. 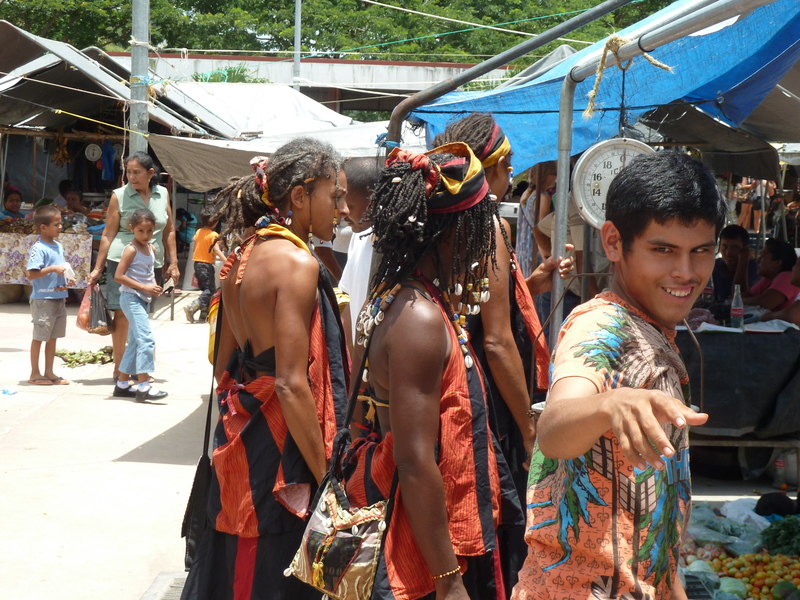 Belize has that bang de drums Caribbean vibe and more so in the Village of Santa Elena. 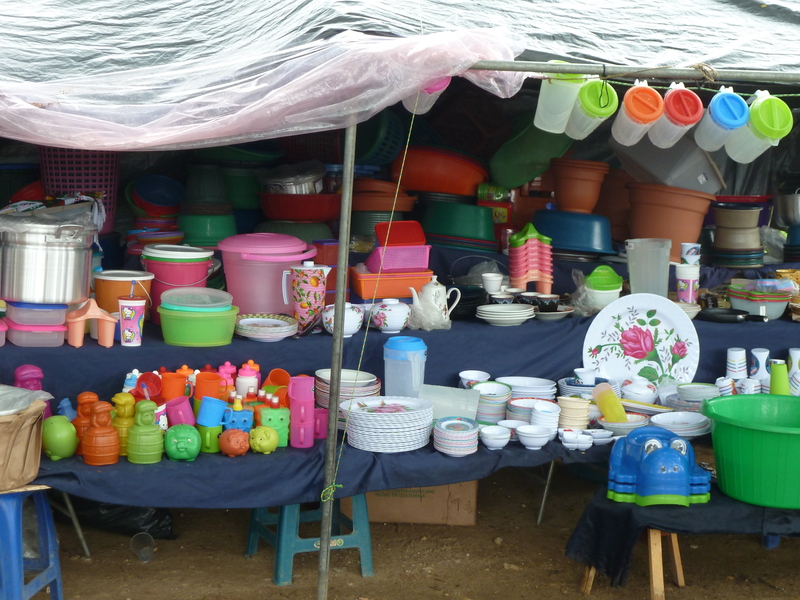 AND THEN THERE’S COOKWARE, CLOTHES, ARTS AND CRAFTS–EVEN SOME GOOD NEW FURNITURE STREWN ABOUT THE MARKET GROUNDS FOR SALE. AND THEN THERE’S THE “PARIS BAKERY” IN SAN IG. NOT EUROPEAN GOOD BUT NOT A BAD BAKERY AT THAT. AND THEY HAVE LOAVES WITH GIANT SLICES OF WHOLE GRAIN BREAD FOR MY HEALTH, AMONG OTHER GOOD STUFF. 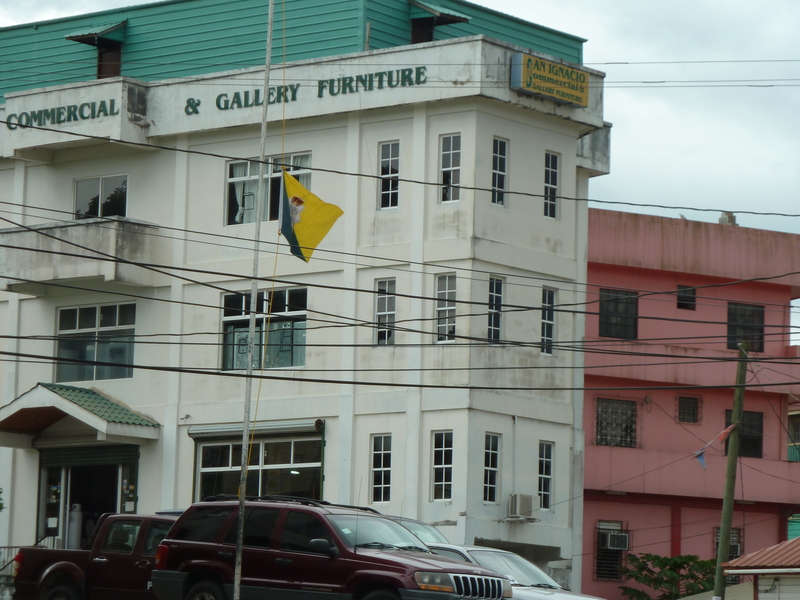 ABOUT AS BIG AS BUILDINGS GET IN BELIZE. FLAGS OVER EVA’S FINE WATERING HOLE AND EATERY IN SAN IG WHERE YOU CAN SIT AT THE RAILING AND WATCH THE TOURISTS COVERED IN OIL STROLL BY. MY FAVORITE HANGOUT WHEN IN TOWN AND A GREAT PLACE TO MEET TRAVELERS FROM ALL OVER THE GLOBE–MET A YOUNG MAN FROM BOSTON WHO IS BACKPACKING ON VACATION FROM HIS MARKETING JOB. TURNED OUT HE HAS GRANDPARENTS IN OKLAHOMA AND RELATIVES IN DALLAS. I love everything about grace, everything that is theological and biblical about it as well as its vast number of other connotations that can conjure up so many feel-good images and thoughts and feelings. Grace is what lifts us to the top of the world, no matter how far down we are. So let us consider grace more deeply and let us begin by considering the very word “grace,” with all its positive and beautiful implications as opposed to whatever in this world might be destructive or soul-crushing or vulgar, because Lord knows there is enough that is destructive and soul-crushing and vulgar to go around in a world so full of mindless entertainment and time wasted on all the distractions that pull us away from all the grace all around. Who isn’t enthralled watching an ice skater or a couple on ice making grace on ice look so casually easy? Remember the beautiful and elegant actress with the world’s greatest smile who left behind acting at the top of her career to marry royalty and become Princess Grace? (If you remember Oscar winner Grace Kelly, your are of a certain age, and advancing). God’s natural creation, which we simply refer to as “nature” or “the great outdoors,” is full of the bizarre and the violent and beastly creatures who eat their young, but so full of so much beauty and grace as well. Grace is innocence; grace is purity. Grace lifts you to the top of the world no matter how far in the bottom you may be. Grace is the great free gift from God, who loves us in spite of ourselves. SISTER JOY–HER OF THE GREAT STATE OF OREGAN–WHO DIDN’T REVEAL THAT SHE IS AN AMERICAN UNTIL I ASKED HER IF SHE IS BELIZEAN. 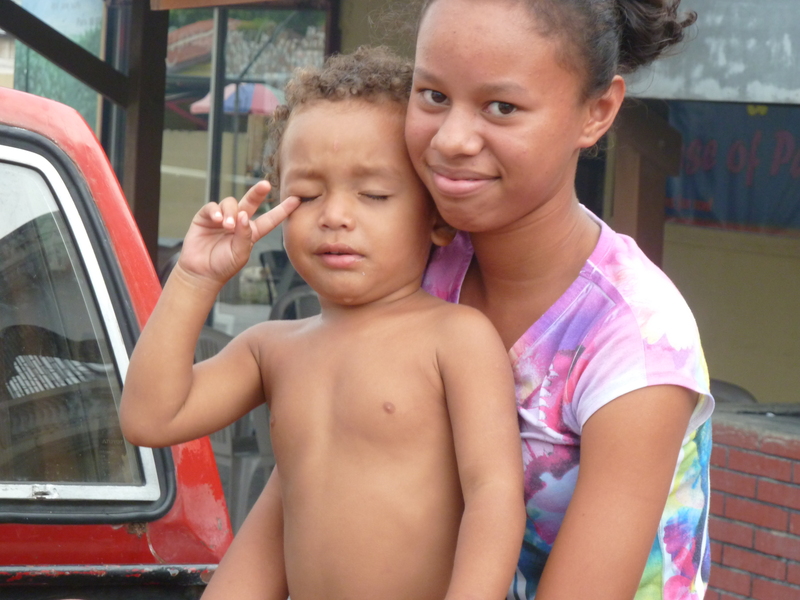 TURNS OUT HER MOM IS FILIPINO SO IT’S NOT LIKE SHE DIDN’T HAVE SOME SKIN COLOR GOING ON THAT LOOKED A LITTLE BELIZEAN. So earlier and very early on this Fiday I got up and made the 30-minute walk down the Western Highway of Belize to the Village of Benque, where I’ve been trying to get Internet service paid for and installed in my casa in the Village of Succotz, and hopefully they will be installing internet in the aforementioned and spacious and comfortable new home of mine tomorrow–Saturday morning. Been having to come to Benny’s for internet access and as much as I like “Benny” (whose name is actually Bendigo or something lots more complicated than Benny) and enjoy Benny’s All-Purpose Restaurant, Pit Stop, Bar, Always Cool and Covered Outdoor Cafe, Grocery and Old Fashioned Mercantile, Arts and Crafts Stall, Ice Cream Parlor and some of some of the best milk shakes in Belize, where milk shakes are very popular with the people–yes, as much as I like Benny’s Kitchen I’d rather have Internet at home and not have to hang at Benny’s quite so much. Did I mention Benny’s has a nice bar and that Belize is internationally known for its exceptional, home-grown and widely distributed beer? One could hang out at Benny’s too long on cool nights like this. 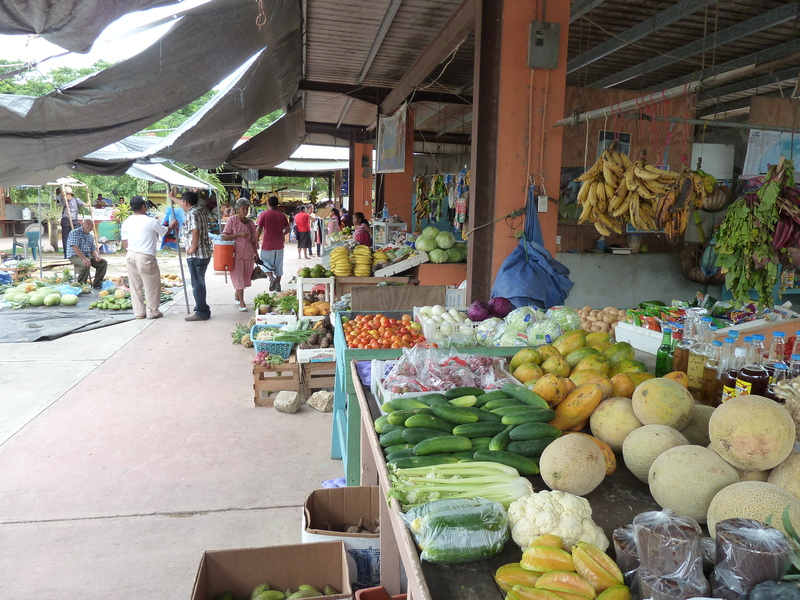 I’m going again to San Ignacio tomorrow because every Saturday, the growers and farmers from far and wide bring their fresh fruit and veggies to the much-heralded San Ignacio Market. People go to this market Saturdays, from many miles around, because the produce is so good and the prices so cheap. 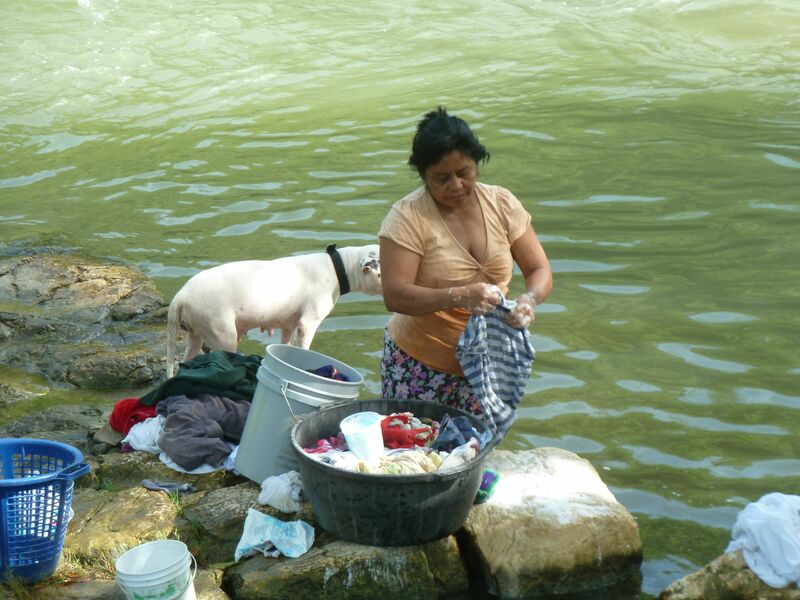 Or so everybody and his and her dog in Belize tell me. 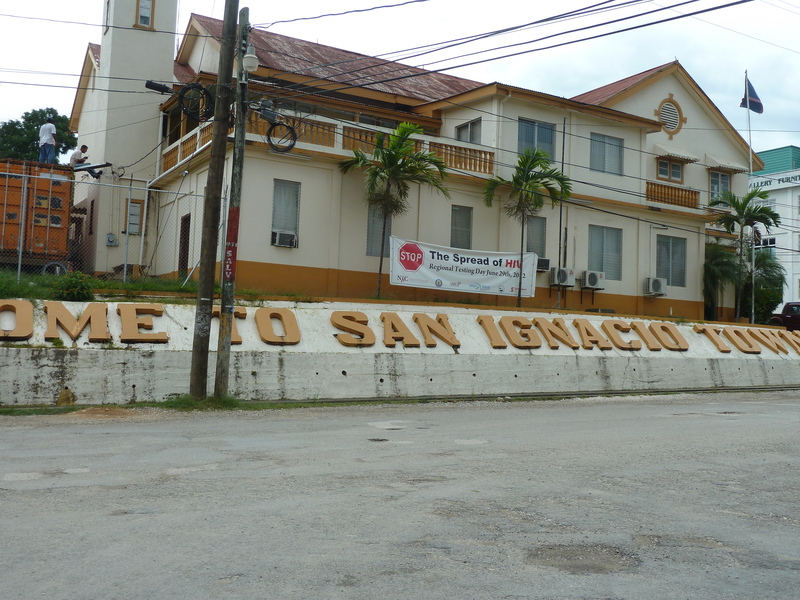 By all accounts, going to Market in San Ignacio is simply what you do in the Western region that is the Cayo District (districts are sort of like our states) of Belize. So I look forward to stocking up with lots of fresh and genuinely organic health food tomorrow. But I digress, as I’m prone to do here at the blog that is saving the world, where stream of consciousness reigns. After I paid for the Internet service in the Village of Benque Friday, I moseyed right across the street to the Village’s stately white Catholic Church and walked in to look around. Beautiful and stately and old Catholic Churches, with creaky old wooden pews, really ring all my inner spiritual bells, as longtimers of the Jitterbug Cult know–and lo and behold, when I walked in, there was a Sister sitting in a pew with her prayer book, and she was clad in a very traditional and lovely white habit. 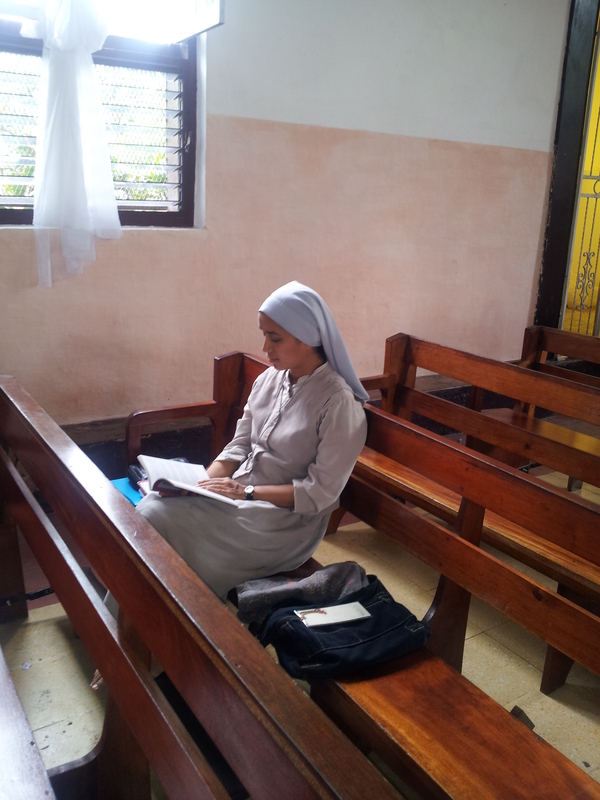 The young Sister and I sort of nodded in acknowledgment at each other and I looked around and then went back and asked her if she minded if I asked her a question and she didn’t mind, and she filled me in on the Church and when mass times are (7 p.m. every weeknight among other times) and who the two priests are and all that. I mean, she has dark skin and looked Belizean enough so I just asked outright if she’s Belizean. “I’m from Oregon,” the Nun said, grinning. What a snively nun Sister Joy is. She played this fellow American for grins but I didn’t have a clue she’s a Portland girl. (Well done, Sister.) Turns out her Mom is Filipino, which explained the dark skin. And her being from Oregon no doubt explains why she spoke far better English than your favorite Texas blawger. Well, anyway, she said she and two other Sisters live in a convent across from the church’s pretty, fenced-in, hilltop grounds, and I look forward to getting to know her and the other Sisters and the two priests (one is traveling in American currently), even though I did also meet, and was fast friends with, the church secretary, an altar boy who was hanging around today, and some other nice church members. Also met a nice young parishioner who works at the church who was especially talkative and who showed me around the church and urged me to walk around “our nice village” and the new park down by the River. “And Guatemala is right down there,” he said, pointing to a whole other nation. 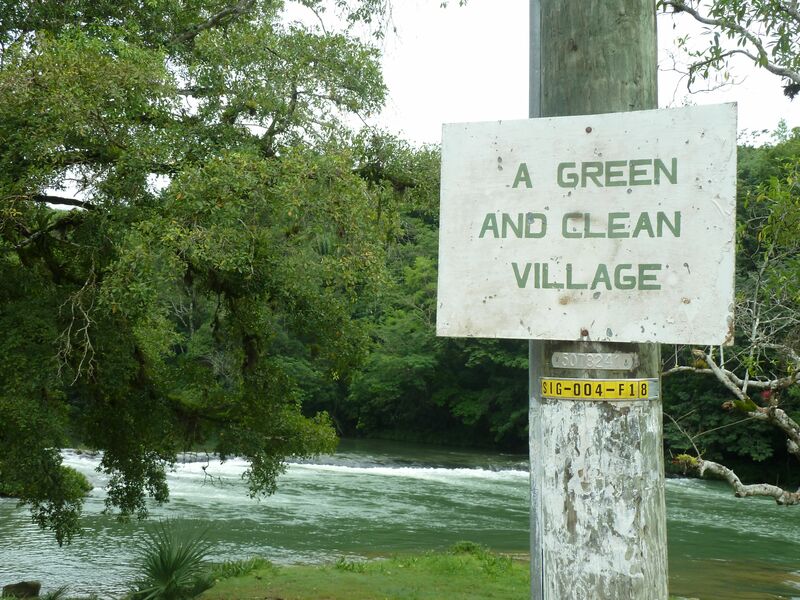 The Village of Benque and the Village across the border in Guatemala have such friendly connections that there is a soccer field, half of which is in Guatemala and half in Belize. This I have to see someday–a soccer field shared by two countries and their youth. Interesting part of Planet Earth I’ve landed in here. 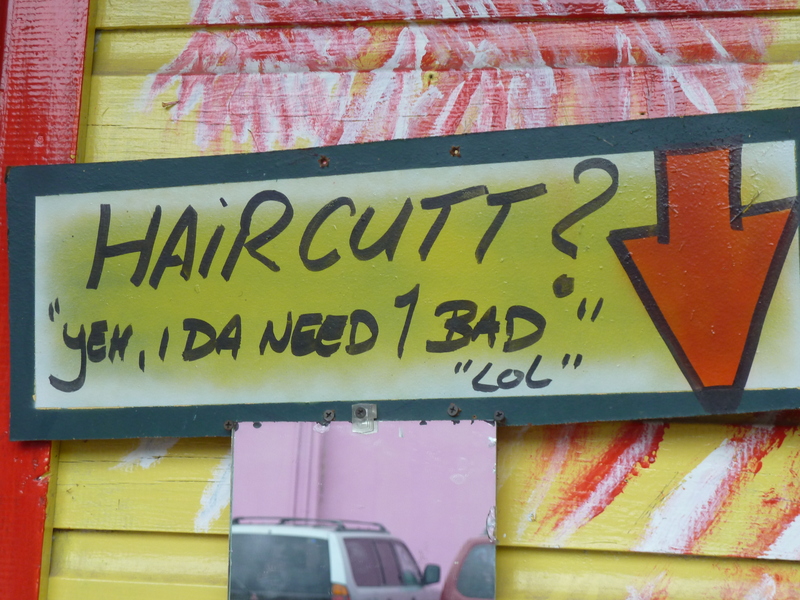 I Belize I will like it a lot. 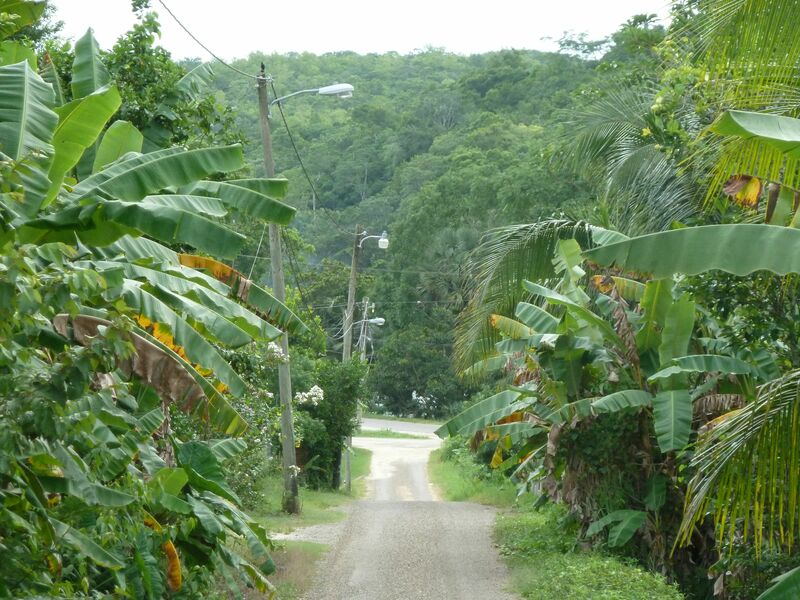 The loveliest lane in the Village of Succotz, Cayo District, Belize, near mi casa. 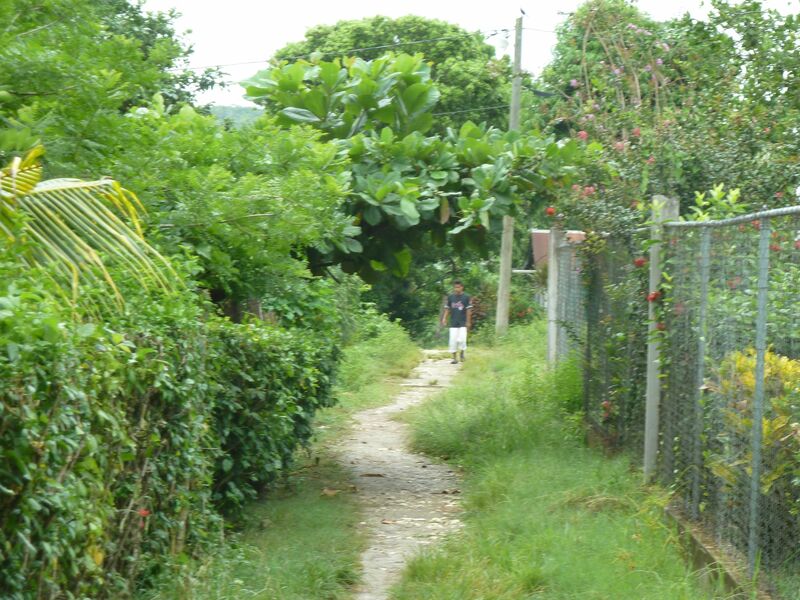 A meditative stroll down this lane will help you get right with God and the world. 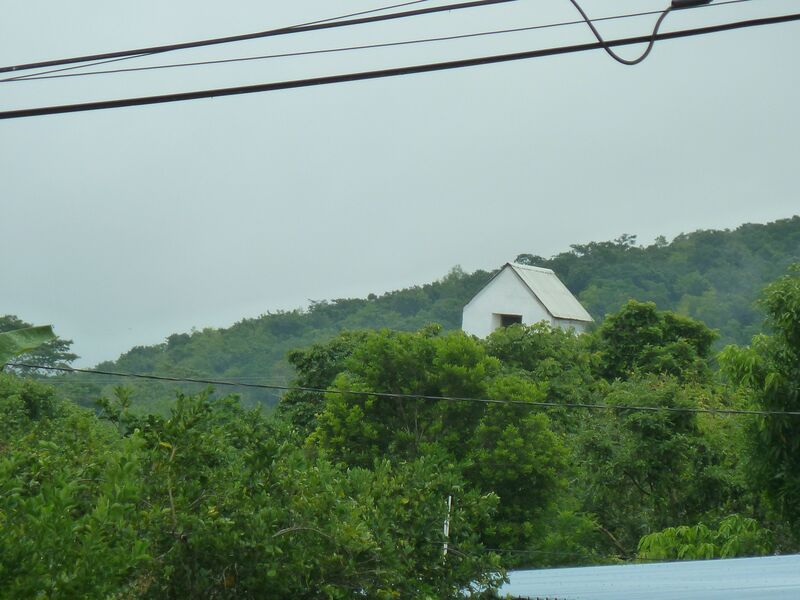 FROM MY BACK DOOR AT HOME: A TREETOP VIEW OF THE TOP OF THE CATHOLIC CHURCH IN THE CENTER OF THE VILLAGE. THE OLD MISSION WITH THE CREEKY WOODEN PEWS, WHERE I KNEEL AND PRAY AND GET ALL SPIRITUALLY ALIGNED WITH THE ALMIGHTY SOMETIMES, IS LOCATED BETWEEN THE COP SHOP AND BENNY’S ALL-PURPOSE ONE-STOP FOR FOOD, DRINK, GROCERIES, HARDWARE AND WIFI. MORE ON MY MEETING BENNY DOWN BELOW. So as hot and especially as humid as it can get here in the jungle villages of Western Belize, the tropical storms can come on fast and hard and linger for a couple hours or more, but they also bring such cool relief and sometimes the cool lingers a good while. I slept like a Belizean baby last night with the windows open and leftover sprinkling rain lulling me to sleep at 9:30 p.m. (a record bedtime for a night owl like me). I rose at 6 (ME UP AND AT ‘EM AT 6 A.M.!!! NO KIDDING, KIDS! ), did some serious writing over morning coffee on the book I’ve delved into writing, and it was still cool on the walk to Benny’s for late breakfast this morning. It’s very cool now in the outdoor cafe at Benny’s where I do more writing when I have the cafe to myself between the breakfast and lunch crowds. I met the enterprising Benny yesterday, in fact. He’s a local whose name is actually Bendigo. He runs a great restaurant with super food, complete with an outdoor cafe, internet service, bar, grocery and mercantile store. And then there’s the Mayan arts and crafts and jewelry and books on Belizean and Mayan history and culture for sale at Bendigo’s place. To paraphrase His Greatness Arlo Guthrie’s great sixties song, you can get (almost) anything you want down at Bendigo’s Restaurant. It draws not only locals but all the tourists and young backpackers who come to see the famous Mayan ruins across the river a mile from my rental home. I haven’t even crossed the river on the charming, hand-crank operated ferry that constantly shuttles vehicles and pedestrians stepping off the tour buses or cabs to drive or walk the one mile to one of the most famous and enduring Mayan landmarks in the world. 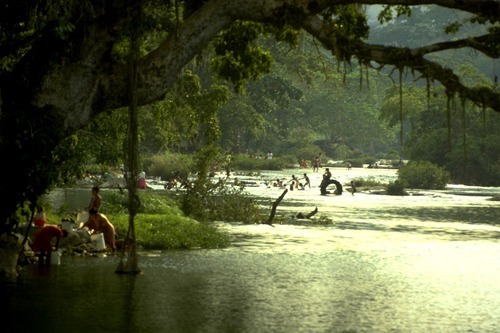 Almost sad to say that I live here now and haven’t even made it over to ancient and sacred Mayan site–the biggest tourist attraction in town and in all of Belize. It’s not like I won’t have opportunities to go over there and hang out any time in the future that the Mayan spirit moves me, or to a lot of other Mayan sites in this very Mayan part of the world. I LIVE with Mayans now. And they are warm and friendly and wonderful peeps. I’M LEARNING THE TRAILS AND SHORTCUTS AROUND THE VILLAGE. 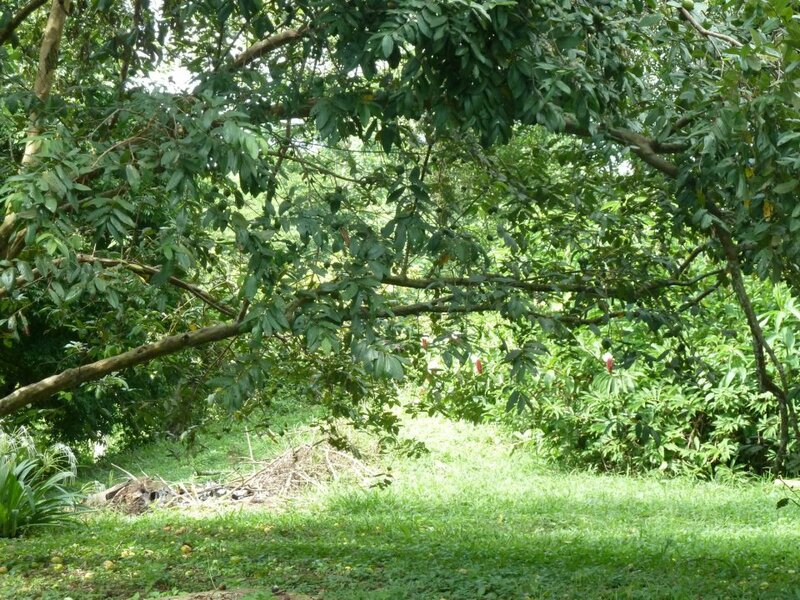 AND WHY I TAKE THE SHORTCUTS I DON’T KNOW–I ALWAYS END UP MORNINGS AND LATE IN THE EVENINGS WALKING ALONG THE MOPAN RIVER TO SOAK UP THE BEAUTY AND THE CALMING INFLUENCE OF IT. ANYBODY MISSING A HORSE THIS MORNING? THERE’S LOTS AND LOTS OF THOSE JOHN MELLENCAMP LITTLE PINK HOUSES IN BELIZE. 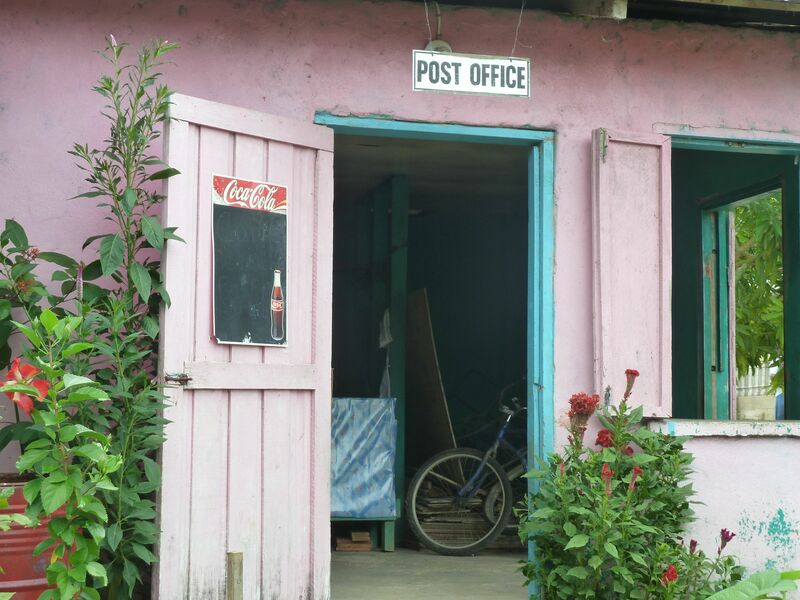 EVEN MY POST OFFICE IS A ROOM AT THE POSTMASTER LADY’S LITTLE PINK HOUSE IN SUCCOTZ VILLAGE. 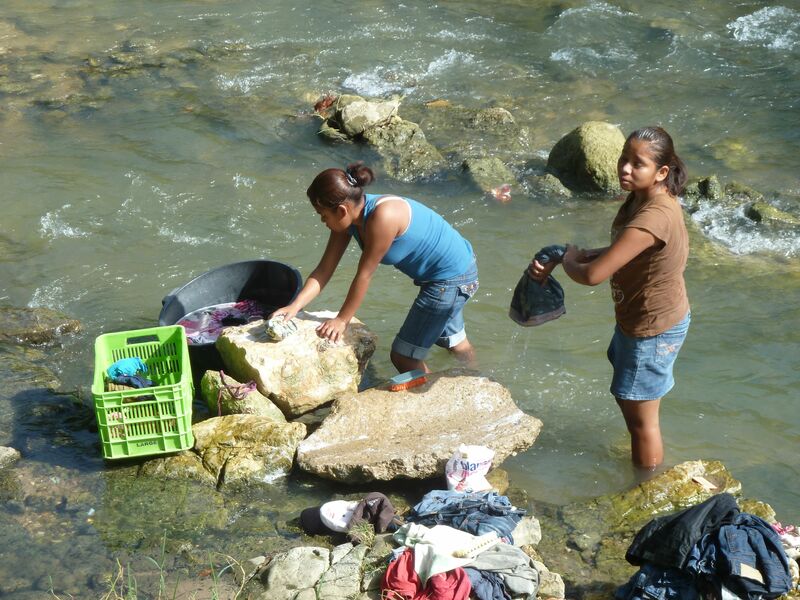 I TELL FRIENDS BACK HOME I’M LIVING IN A CENTRAL AMERICAN MAYBERRY. 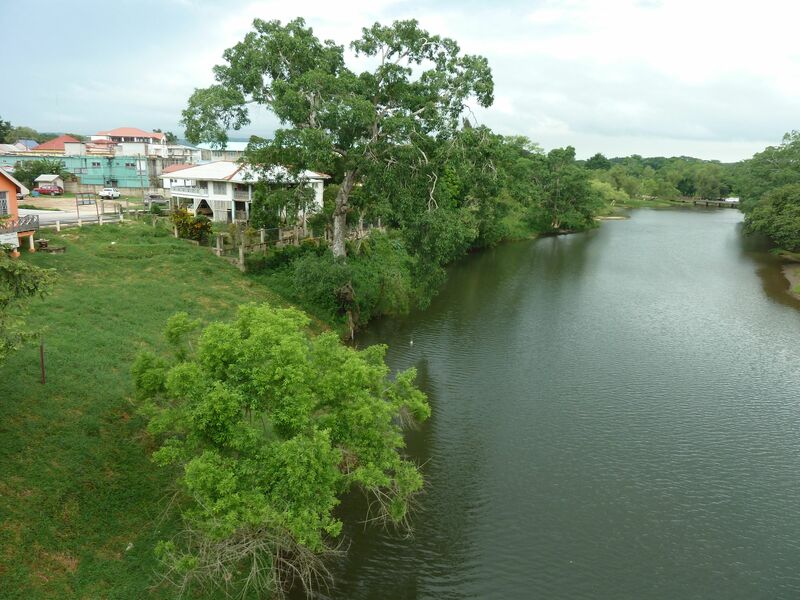 Sunday, when I arrived in Belize, people were swimming, playing and generally relaxing in and around the beautiful, winding Mopan River–a block from my house. 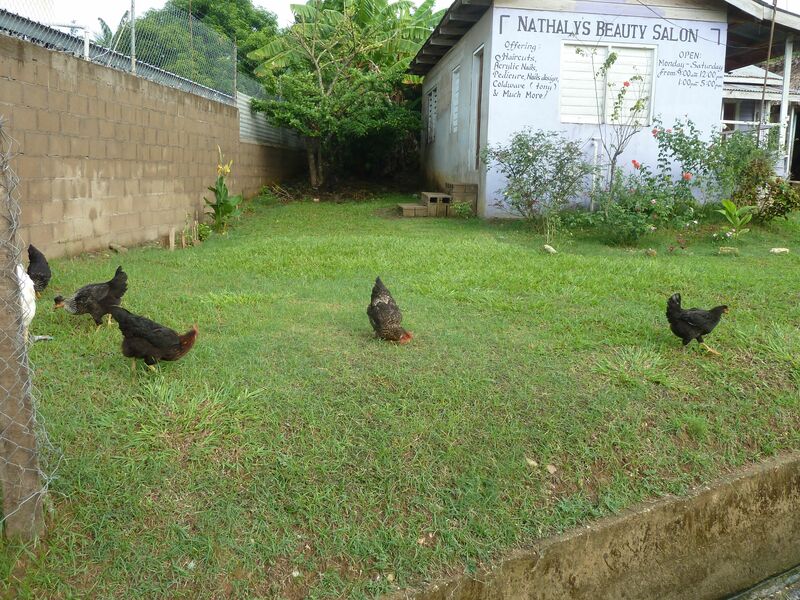 This morning as I was walking to Benny’s for breakfast, there weren’t many people to be seen playing around or in the Mopan. But there was a good bit of hard work going on in the River. 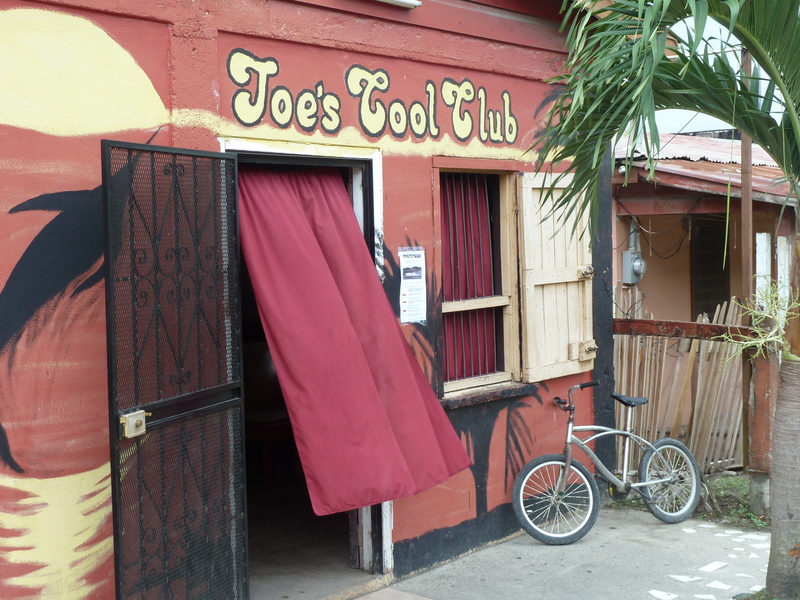 Been getting settled in here at Succotz Village, you of the Jitterbug Cult. But figured it was time to check in and let you know that your worthy leader is alive and well and blessed in Belize . . . .
SUMMERTIME, AND SOMETIMES THE LIVING IS EASY IN SUCCOTZ, A MAYAN VILLAGE. SOMETIMES, LIVING IS NOT SO EASY. 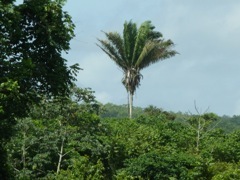 A few more pretty pix of Belize so far can be viewed on the my Facebook page (at Paul David Mckay, with a little k, which makes my youngest born crazy (Dad! OMG! Please change that and get the family name spelled right!!! ), but lots more of the beautiful landscape to come here soon enough, and more of the usual, every-day jitterbuggingforjesus.com to which millions of readers around the world have subscribed out of fear that they may miss something totally whack that the leader of the Jitterbug Cult has up and done now. But rest assured, now that he has seen the village jailhouse, he will be getting in no trouble. Earlier today I posted a poem from “Spoon River Anthology” in honor of those clergy called to do God’s work–ministers who just slug away at it all their lives with little recognition that they would not care to have if they were much recognized for it. Then later in the day I learned the following news of Methodists doing mission work in The Ukraine who were killed doing the work they were called to do. The story saddened me to no end and I pray and feel for their loved ones. Here’s the sketchy details from the United Methodist General Board of Global Ministries, which oversees the work of missionaries working in mission fields way far from their homes. 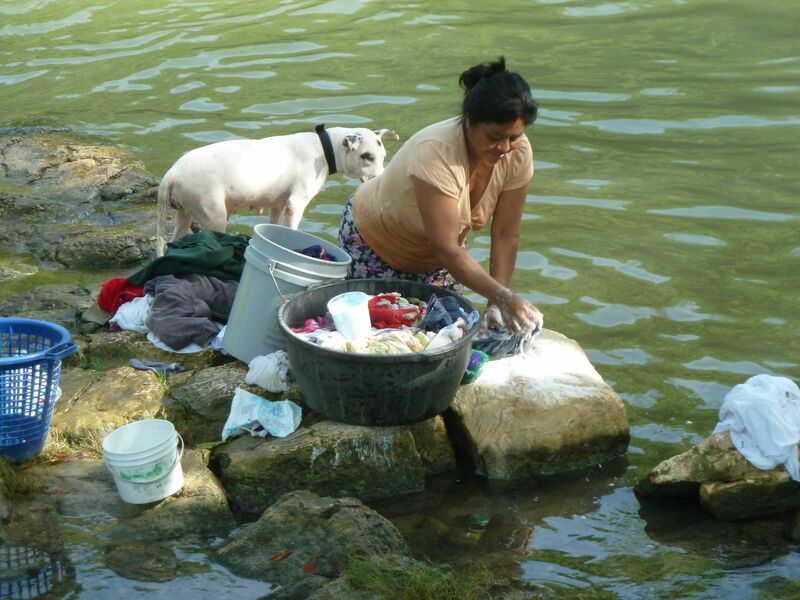 July 10, 2012—The Texas Annual Conference and the General Board of Global Ministries of The United Methodist Church learned today that an accident has occurred involving a mission team from the Houston area. Both First United Methodist Church in Sugar Land, Texas, and Lakewood United Methodist Church, Houston, sent church members on the mission trip to the Ukraine to repair a church facility. This morning, the roof of that building collapsed, causing fatal injuries to David Nevotti of First UMC, Sugar Land. David’s wife, Cathy was also on the mission team, but it is our understanding that she was not injured. The church in Sugar Land has notified David’s three children. A member of the student ministry of the University of L’viv, Illya Onoprienko, was also fatally injured during the collapse. Rev. David Goran, a United Methodist missionary serving in L’viv as a student ministry director, was seriously injured. Plans are underway to move him to a hospital in Kiev. Rev. Goran and his wife, Shannon Goran, are missionaries of the General Board of Global Ministries of The United Methodist Church and sponsored by several local churches within the Texas Annual Conference. First United Methodist Church, Sugar Land and Lakewood United Methodist Church have been involved with the Ukraine mission for several years. Several members of the mission team will be returning to Houston later today. It is with deep sorrow that we share this tragedy. We, of course, mourn this loss of one member of our church family, but also the loss of the young man from Ukraine, who was our partner in mission. May God be with her family and the Nevotti family to surround them with love. We also pray for healing for our missionary, Rev. Goran, and for all those who are suffering as a result of this tragedy, including the communities at the University of L’viv and First UMC, Sugar Land, and Lakewood UMC.